ReZoom supports healthy levels of endurance to both mental and physical stress by directing broad spectrum nutrition to vital tissues. Ideal for people who workout regularly and exercise at high levels, the components of ReZoom replenish nutrients lost during vigorous activity and promote peak performance and condition. Herbs renowned for increasing stamina such as ginseng and yerba maté are combined with vitamins and minerals to ensure enzyme co-factor support. Cardiac reserve and circulatory tone are supported by hawthorn and yarrow. Protection against free radicals is highly supported by additional phytonutrients and vitamins. ReZoom aids metabolic balance and can be used within a weight management program. Herbs such as ginseng and yerba maté, renowned for increasing stamina, are combined with vitamins and minerals to ensure enzyme co-factor support. Hawthorn and yarrow support cardiac reserve and circulatory tone. Protection against free radicals is highly supported by additional phytonutrients and vitamins. 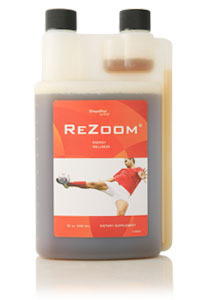 ReZoom aids metabolic balance and can be used as part of a weight management program. "I have begun a program of health and fitness products which continues to effect my life. I start my day with a juice drink which contains RiteLife, ReZoom and Yerba Maté. This is followed by a well balanced breakfast including a packet of Start+ and Bountiful Harvest™. Then to wrap up my morning I take the recommended amount of CM Super™ and PBGS+®. During the day I take an allotment of Catalyst Formula to keep me going! I feel good and look good again. I now play basketball, racquetball and walk between 7-12 miles a day."